IMPORTANT NOTE: These padlocks are handmade to order in Germany with a 10-15 day lead time. Key It Twice is as the name suggests. We make the padlock to work from two sets of keys. For example you may have 1 or a number of padlocks that work from a single set of keys which are distributed to your staff or members. If you feel security has been compromised because a key has been lost or because a staff member has become disgruntled and you then fear for the security of your property, then you can automatically disable the first set of keys and bring into action the second set. To do this you simply use one of the keys from the second set to automatically disable the first set. If you have a number of locks under this system then you need only to go around and use a key from the second set in each padlock. You must then distribute the new set of keys to your trusted staff. This Key Twice service is only available on locks that can be dismantled so it can be added only to the 83 Series of locks. 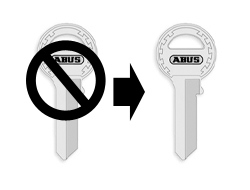 This includes the Extreme, Submariner and Rock Padlocks by ABUS. As you have probably figured out, you will need an extra set of keys for every lock that you "Key Twice". Within the cost of this service is included two extra keys for the second set. They will be clearly marked on arrived. Store them safely and DO NOT use them accidentally or else the first set of keys will be locked out! For every padlock you order you need to add one of this to your basket. If you order 5 locks and wish the Key It Twice service to work with them all then simple select 5 in the qty box above.